Be prepared to be amazed by this remarkable book from author Claire Prentice. Carefully she introduces us to the main protagonist, Mr. Truman Hunt; a man as shrouded in mystery as he is flamboyant; and then just as quickly we are witness to his vagaries and vices, which eventually lead to his ultimate downfall. 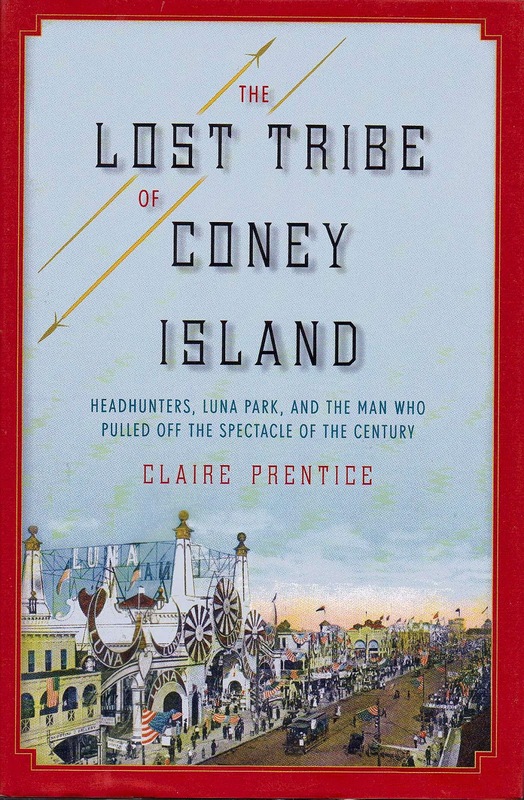 This story takes place in the Philippines and then in the United States; notably in Coney Island at Luna Park; in 1905, just as America was advancing her interests in the Philippine Islands. But the real story begins one year earlier when a band of assorted tribes from the northern Philippine Islands were first exhibited at the International Exposition in St. Louis. But calling it an exhibition did not allay the true purpose of the show; that is to turn a profit. The show featured the natives in a village like setting; kind of like the “natural habitats” found in zoos today, only with human beings on display rather than animals. Truman Hunt had been an assistant governor of the Philippine Islands and was regarded by the tribe known as Igorottes to be a fair minded and intelligent man. And, at first he was. As a physician he was invaluable to the tribe; healing the sick, setting broken bones and even pulling bad teeth. His reputation was so great that at one point it became a symbol of status to have a tooth removed; if only to prove that you had been to the white man’s doctor. He was the man to whom the tribe would come with legal problems, considering him to be a very learned and compassionate man. Having seen the Exhibition in St. Louis Dr. Hunt returned to the Philippines with the idea of bringing his own tribe of natives home to America for a tour of the fairs and amusement parks that proliferated the nation. But any exhibition would require financing and so he began to cast about for partners in his venture. He needed about $3,000 to get the Igorottes to America. It would be a long journey; beginning on foot and then crossing the Pacific Ocean to Washington State and from there by rail to Chicago and finally Coney Island in Brooklyn, New York. By 1904 the movies were beginning to show their potential for entertaining the masses, and to that end most entrepreneurs were scrambling about for newer and bigger ways to attract audiences. In New York City that meant a new venue called the Hippodrome was being constructed. It would be a veritable palace of entertainment for decades to come. It was the Madison Square Garden of its time. Fred Thompson and Elmer Dundy, who owned an exhibit in Coney Island, were also the owners of this new venue. They had heard of Dr. Hunt’s plans for exhibiting the Igorottes and were bidding on the rights to have them set up in Luna Park. The story of the back dealing to get the tribe to America; as well as their reactions to things like ships and trains, which they had never seen; is a gripping story all by itself. This group of natives was planning on spending on year away from their families before returning with enough capital to start businesses and even get educations. But, after every promise made to them has been broken; and after they have been ill fed and ill clothed for over a year, never getting paid for their efforts; they would return home with only $35 apiece. However, they did get quite an education in the ways of the outside world in the time they were gone. The cast of characters include Julio, the Igorotte who acts as the interpreter for Dr. Hunt and the tribe. He is also the most affected by Dr. Hunt’s eventual betrayal. As the interpreter he felt personally responsible for all of the lies he has relayed to his friends and family. Even when the case comes to court he feels some guilt at betraying his master. By that time the tribe; as well as Julio; had been reduced to slave like status, following Dr. Truman wherever he led them to make a buck. This is a story of an innocent people who think they have made bargain to ensure their future, relying on the word of the man they had come to view as somewhat of a god. This is also the story of how he abused that trust, becoming; as the money rolled in; a completely different person than the man he had been before. It is also the story of the Unite States government and their search for Dr. Hunt on a variety of criminal charges; ranging from kidnapping to robbery and even bigamy. The book is filled with villains of every stripe; but for every villain met along the way there are heroes who pursue the case doggedly, until the Igorottes have been returned to their families. This book is a tour de force for the author as well as the reader. Ms. Prentice has created a book which not only chronicles the case at hand, but also the climate concerning entertainment and what was acceptable as such at the time. And along the way she gives a wonderful history of Luna Park; and the fascinating men, and money which created it.